I’m sure that for many, the title of this dish is enough to warrant skipping right over it and moving on to the next recipe. But don’t let your greenness with frog legs discourage you from enjoying this highly underrated meat that is a surprising delight to neophytes. The adage that “they taste like chicken” is a testament to frog legs’ unassuming flavor and familiar texture that won’t take you far from your culinary comfort zone. 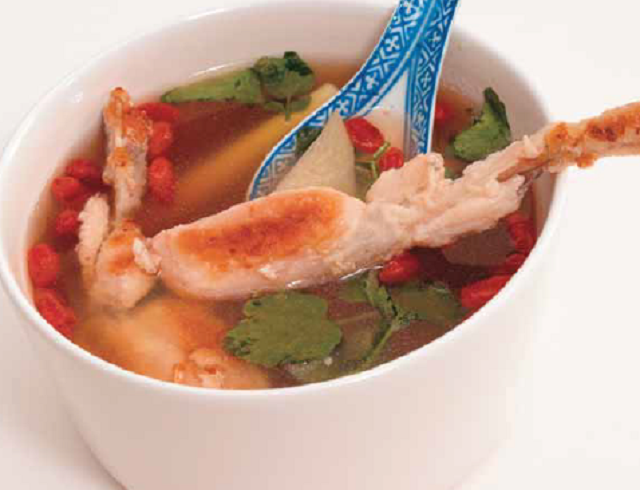 The broth, perfumed by herbaceous lemongrass, green papaya, and ginger, is the perfect milieu for the delicate flavor of frog legs, making this clean fresh soup an irresistible pleasure. Frog legs are available fresh at Asian markets or frozen in the seafood section. They require little or no preparation and come ready to cook for easy convenience. If frog legs are unavailable to you, use chicken breast or sea scallops as a substitute. 1. Heat the olive oil in a large sauté pan (3 to 4 quarts/liters) over medium-high heat. 2. Dredge the frog legs in the flour, shaking off any excess. 3. When the pan is hot, place the frog legs in the pan and sear for 3 to 4 minutes per side until the meat is well browned. 4. Once all the frog legs are seared, return them to the pan and add the rice wine, scraping off any caramelized bits on the bottom of the pan. 5. Add the ginger, lemongrass, and chicken broth and simmer for 15 minutes. 6. Add the green papaya, lycium, fish sauce, and pepper. 7. Simmer another 5 minutes until the green papaya is tender. Turn off the heat and stir in the watercress. 8. Ladle the soup into bowls and serve hot.